Slammed stance. Chopped fenders. Knobby tires. Blacked-out and stripped-down. The Scout Bobber is no frills, all attitude. The only place we didn’t hold back: the 100 barely-tamed horsepower of a 69-cubic-inch V-Twin. Grab on. Hold fast. Your legend is just getting started. Chopped Fenders: The Scout Bobber proves that less is truly more. True to classic Bobber style, the front and rear fenders are chopped. 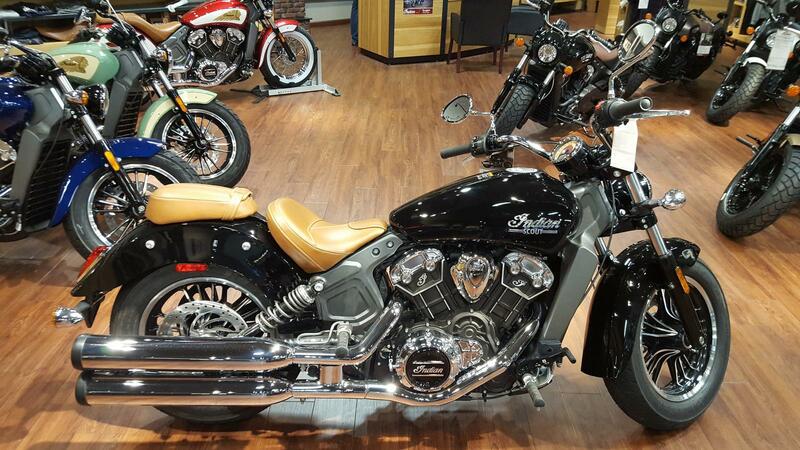 100 Barely-Tamed Horsepower: A 69-cubic-inch V-Twin with 6 speed transmission pumps out an impressive 100 horsepower for head-snapping acceleration and plenty of passing power. 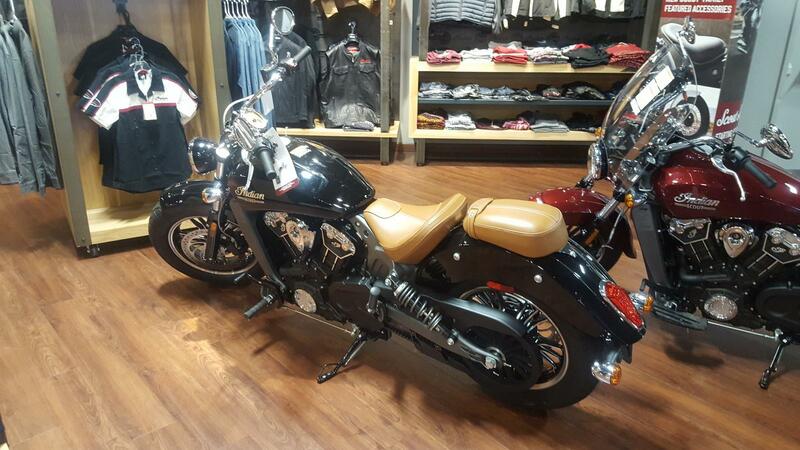 All of this power comes with confident control and sporty, firm handling through every curve and straightaway. 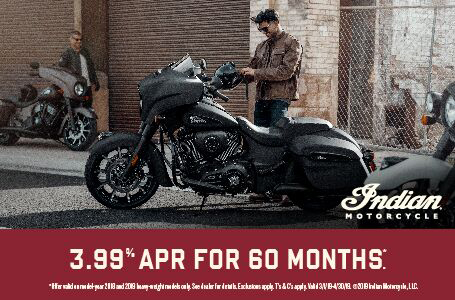 Stripped-Down, Blacked-out: The Scout Bobber has more of what you need and nothing that you don't. 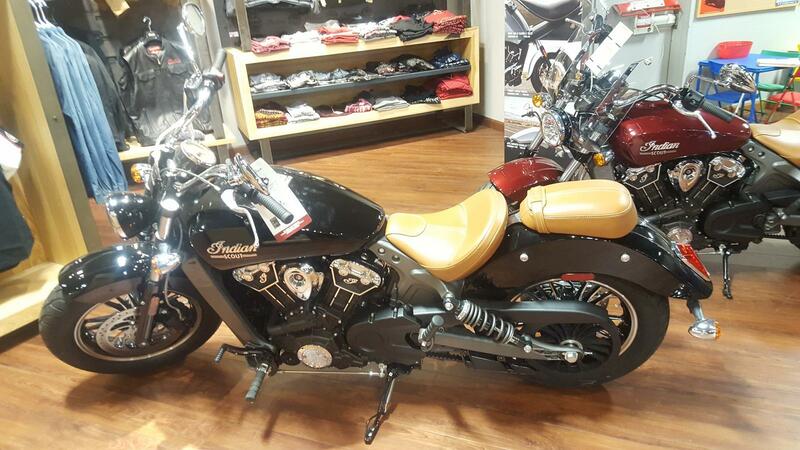 It has a raw, mechanical look, minimal engine covers, and blacked-out exhaust, frame, handlebars and mirrors. It may be stripped down, but it always stands out. Slammed Stance: A slammed stance with the rear suspension lowered 1" creates a low-slung profile that delivers unfiltered feedback from every inch of blacktop. Blacked-out Headlight Nacelle: When we say blacked-out, we mean it. The Scout Bobber is drenched with premium black finishes, including the front headlight nacelle. Cartridge Fork Front Suspension: The Scout Bobber is a smooth ride in a mean body. With cartridge forks and expertly tuned front suspension, you'll experience a stable ride at all speeds. Aggressive, Knobby Tires: Every inch of this bike is a premium expression of aggressive street style. Knobby tires give this bike a menacing look. Purposeful Peg Position: We pulled the pegs 1.5" closer to the rider and added street tracker handlebars, putting you in a more aggressive riding position. The bond between man and machine has never been greater. Liquid-Cooled, V-Twin Performance: The Scout Bobber is fueled by a 100 horsepower V-Twin engine that delivers best-in-class performance. Liquid cooling ensures optimal performance in a wide variety of conditions and a cool, comfortable ride. Low-Slung Leather Bobber Seat: A low-slung, brown leather bobber seat heightens the Scout Bobber's minimalistic style. It gives the bike an aggressive stance with the agility to rip through every curve and straightaway. Side-Mounted License Plate: To show off the chopped rear fender and knobby tire, we mounted a low-key license plate mount to the side of the bike. Street Tracker Handlebars: The Scout Bobber comes standard with street tracker handlebars. Their low-rise profile puts you in a forward, more aggressive riding position so you can carve through the Urban streets with ease. Bar-End Mirrors: Bar-end mirrors sit up or drop down for a sleek, low-slung silhouette in line with modern Bobber styling. Black Gauge Face: The black gauge face complements the bike’s blacked-out style, making everything about the Scout Bobber mean and aggressive. 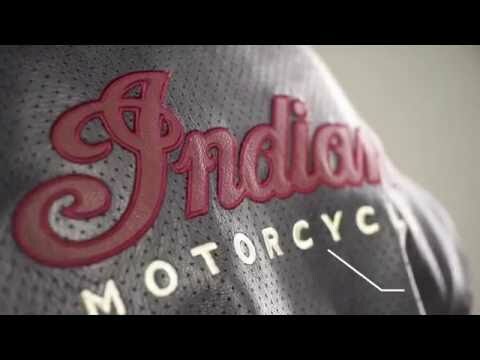 All-New Tank Badge: No motorcycle brand is as legendary as Indian Motorcycle. The Scout Bobber proudly features an all-new tank badge. Bold block lettering pulls the iconic Scout emblem into a more commanding place. 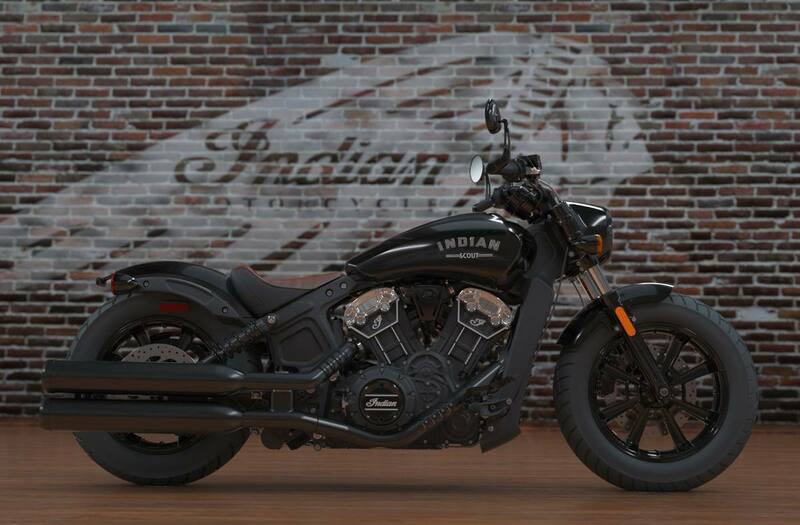 Blacked-out, Slotted Exhaust: The Scout Bobber has a commanding presence that won't be ignored. 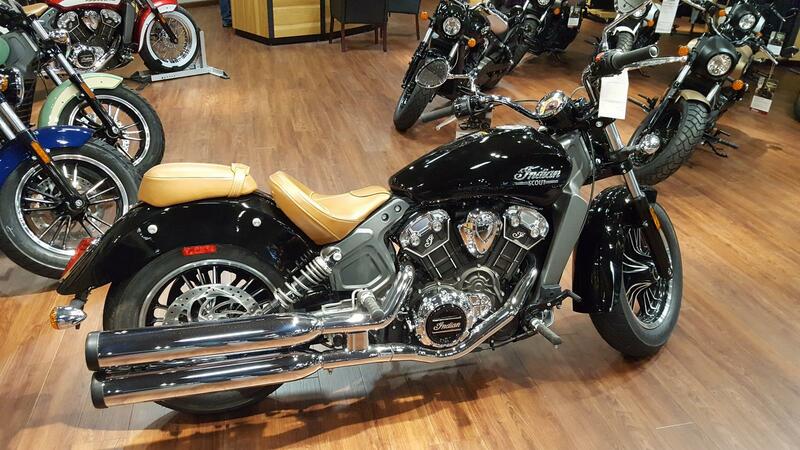 Blacked-out, slotted exhaust pipes reinforce its bold, sinister styling. Black Cast Aluminum Wheels: The Scout Bobber isn't afraid to make a bold statement. 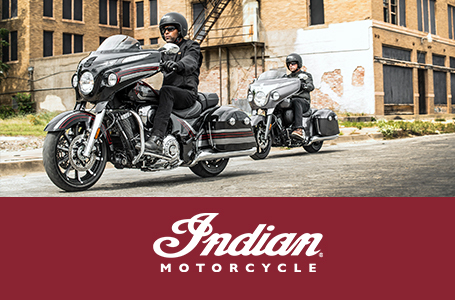 Black cast aluminum wheels hugged by knobby tires merge on-road performance with urban style. LED Turn Signals: Details matter. And we’ve thought about every one. For a minimalistic look, bright LED lights take over duties for stop, turn, and tail signals. They tightly hug the rear fender for a clean line from tip to tail.